Damhnait Doye, is a Canadian singer/songwriter born in Labrador City, NL. She is a folk/pop/country singer. She was a member of the group, Shaye (Kim Stockwood/Tara MacLean) from 2003 to 2009 and a member of the group, The Heartbroken (Blake Manning/Stuart Cameron/Peter Fusco) from 2009-2017. She has won in 2001 four ECMA's. In April 2019, she released a new solo album entitled, Liquor Store Flowers. The CD contains 11 new songs. Damhnait wrote 4 of the songs and co-wrote the other 7 with, Robyn Dell'Unto, Emily Reid, Gordie Sampson and Carolyn Dawn Johnson. Damhnait Doyle-Adam Warner-Luke Doucet-Andrew Bolous-Jason Sniderman,Burke Carroll-Miranda Mulholland-Serena Ryder (vocals), Kim Stiockwood (vocals), John Dinsmore, Chad Murphy, Stuart Cameron and Gordie Sampson. The CD was produced by John Dinsmore and Tracks 1, 2 and 8 produced by Damhnait Doyle with John Dinsmore. All songs words are included in the CD Jacket which makes it great to followeach song while Damhnait is singing. Damhnait does a great job singing each song and each song is well written and all tell stories says Atlantic Seabreeze and the CD will certainly guarantee award nominations and perhaps awards in the coming months and next years ECMA's. A well deserved a 5 star rating out of 5 stars from Atlantic Seabreeze on its rating list. 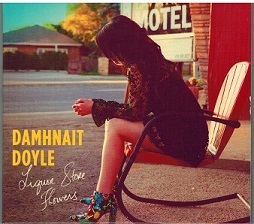 For more information regarding Damhnait Doyle and her music, refer to her website, address posted above.